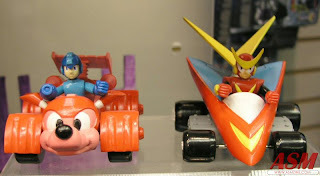 "Dash Racers" -- toys based off of Mega Man Battle & Chase. The prototype packaging indicates these were those fun little "pull-back" toys: gesture the mobile backwards, and away it goes! 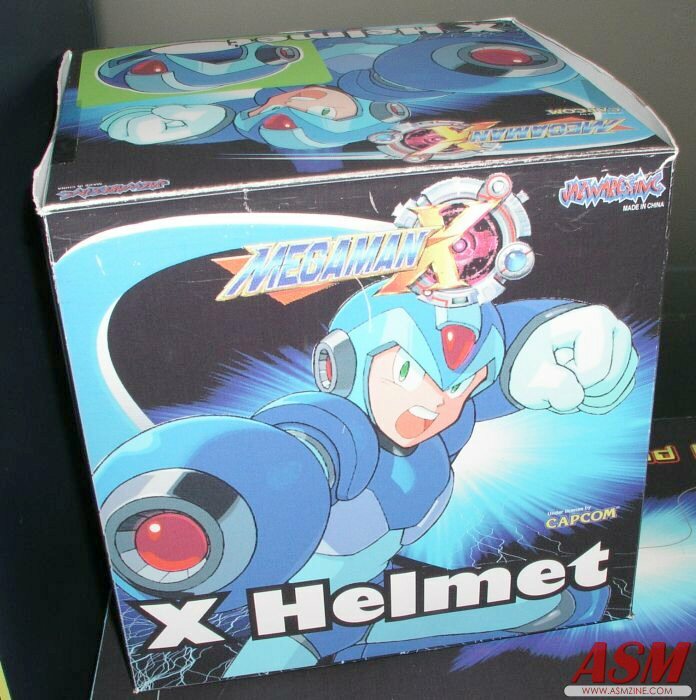 Mega Man X play-helmet. The X Buster did release, but in extremely limited quantities. Occasionally pops up on Ebay. Three-inch Cut Man, Elec Man, Guts Man and Shadow Man. Guts Man's wielding some kind of... club? 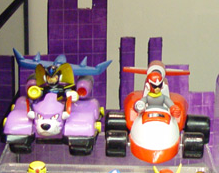 Canceled Wave 5 six-inch figures. Pirate Man's a pretty obscure choice for a toy, wouldn't you say? At the far right is a real interesting concept... seems like Jazwares was toying with the notion of a Ride Armor/Mega Man X figure. X8 Vile is tucked away in the back there, and it looks like they were prepping for a second Command Mission X, which included some kind of shurikens or something. A prototype of Mega Man Volnutt recently surfaced, actually. 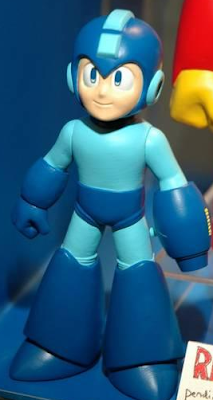 A re-sculpted Retro Roto Mega Man with a slightly alternate posture and face. This guy was original planned for release in late 2005. Apparently, the original sculpt (released earlier that year) would have been phased out in favor of this one. 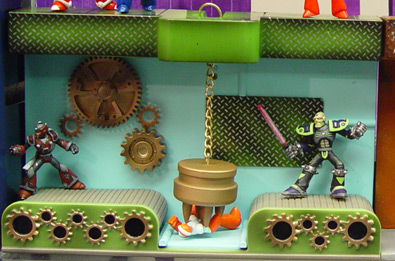 Another play set featuring two very stylized Mega Men and miniature Bass and Cut Man. Intended or not, it looks like the bridge is collapsible. Last but not least, the Air Man resin statue. I believe this was going to be sold as a premium item only at Jazware's official online store. 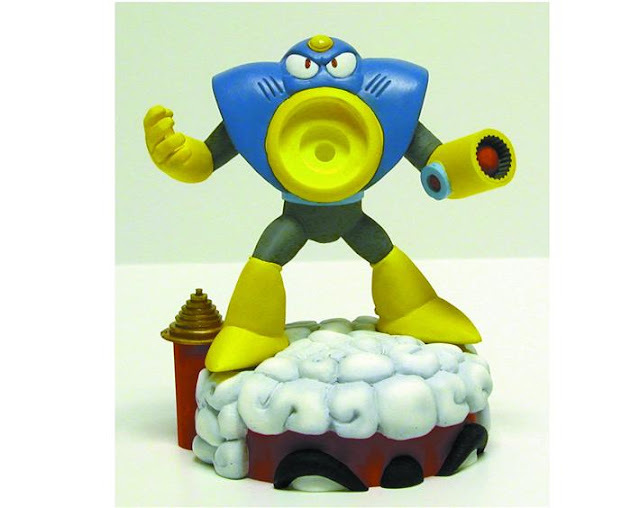 'Twas the most expensive Mega Man item ever offered by Jazwares: $39.99. A huge factor contributing to the cancellation of these products was the fact that nobody was buying the then-currently available toys. Jazwares simply over anticipated: they expected their Mega Man line to be a hit with consumers and planned for far too many products. 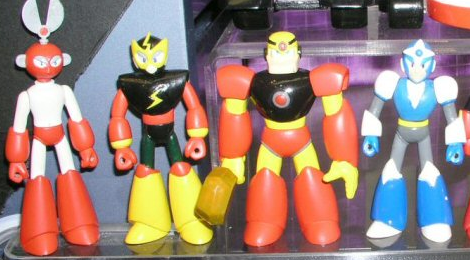 In the end, retailers refused to stock any new Mega Man products by 2006ish, save for the Retro Rotos whose popularity grew and grew. However unfortunate that may be, there's hope we may see some of these items in due time. Jazwares hasn't said much about their new 2011 products since then, but as soon as I hear something, I'll let you know. Previously featured canceled toys can be seen here and here. "A huge factor contributing to the cancellation of these products was the fact that nobody was buying the then-currently available toys." See, people. This stuff didn't made because no one wanted to pay for it, something I hope the current merchandise (such as the Megamix Mangas) isn't suffering from. If it was possible to pirate this, I'm sure you would've done. Face it, You've got no one to blame but YOURSELVES. I simply cannot believe this, those figures are freaking epic! even retro roto Bass and Skullman would make a great deal. Those figures look freaking sweet! AHHHhh I want that Bass figure in Treble Darkstar. They look a bit flat. Man, I always wanted a Sigma figure. And that one unreleased figure of Volnutt as well. Aww there could've been a Command Mission X fig. I love that armor, to be honest I don't like a lot of the figs, but I would've bought the hell out of the X helmet and buster. I was always wondering why there wasn't one (in my stores), I've only seen the EXE buster/sword. Actually, Ark, they did sell a Command Mission X for a brief period of time. It's famous among fans for having a set of fingernails. Look around Ebay, you might find him. Some awesome pictures. 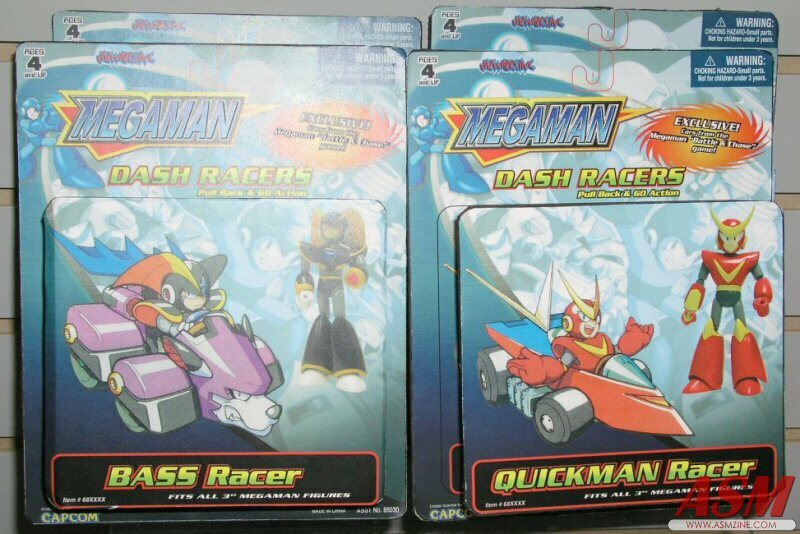 Hopefully Jazwares goes through with some these in their upcoming toy lines. Is these anywhere where all the Jazwares toys are archived? I guess I am a sucker for what-might-have-been pictures. =P. 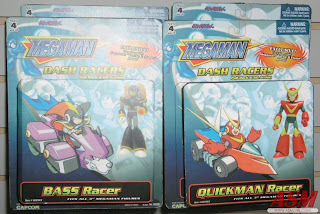 I remember a Retro Roto Knight Man and a Sigma figures etc etc. 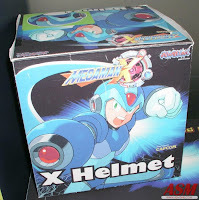 I also would kill for that X helmet. 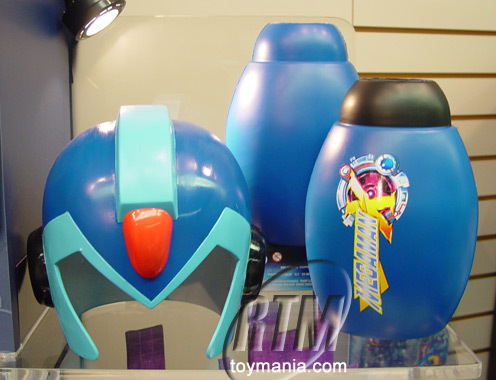 They release a MMX bop bag, but they dont release a helmet? That looked pretty good to boot? Rubbish. I know they released the buster. That's almost half a cosplay right there, lol. I also know that they DID release the media set. The DVD art is different, the comic is the holo version and the figures are the same. Jazwares may have been rough at the start, but I think they are now underrated. They need to perfect and release all these ideas. 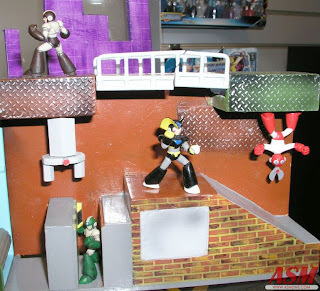 That Airman statue, when put together, makes an airstream with MegaMan at the top caught in it (judging from other images of it). What an awesome display piece that would have been! (Looking at the rainbow of Mega Men) I suddenly have the urge to go buy a set of scented magic markers. I found one of the MegaMan X Busters at value village a little while ago, I grabbed it right away XD. I didn't know they even made those! I have the Mega Man X Arm Cannon toy, but I had no idea it was so rare. Any idea how much it goes for on ebay? Just curious! Thanks. The bundle really was released. I was really young and didn't have the cash for it, but I recall seeing it for I think 2o bucks at my local Shopko. Here's picture of that media pack to back up MegaMac's comment about it. My friend and I bought Proto Man and Rush figures when we found them at Big Lots one time and then for Christmas, he got me a Shadow Man figure. They're pretty neat. While certainly I do not encourage pirating in the least (except for OSS D:<) what you are saying is just ridiculous. actualy, i'd take a second look arround the internet on that zero V sigma set. i'm almost possitive i seen that one in a store. could be wrong, but i'm pretty sure i did. were there any sets similar to it that were confirmed to be released? Wait, CM X fig had fingernails? I find it awful of myself that I've had this figure all this time and never noticed that myself. 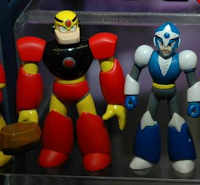 THey never did make Zero Vs Sigma, but they did make the same dio with X and Sigma. I have one I got at biglots for 8 bucks. I actually ordered the Air Man statue. When they canceled it they didn't send me an email telling me it was canceled but rather they sent me a package containing a full set of the classic and X 2in figures and a note saying the product was canceled. So that was pretty neat. How is an informative blast from the past old? PRC isn't just about news, you know. So, i found the X Buster, but the Helmet WAS cancelled? as in, no chance of finding? Put @Blade when responding to me please. i need these for a cosplay.